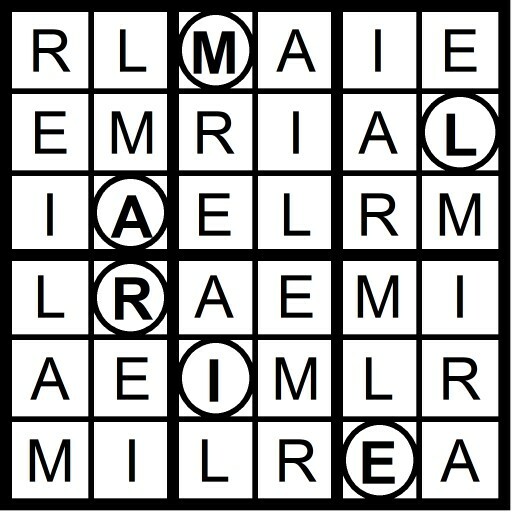 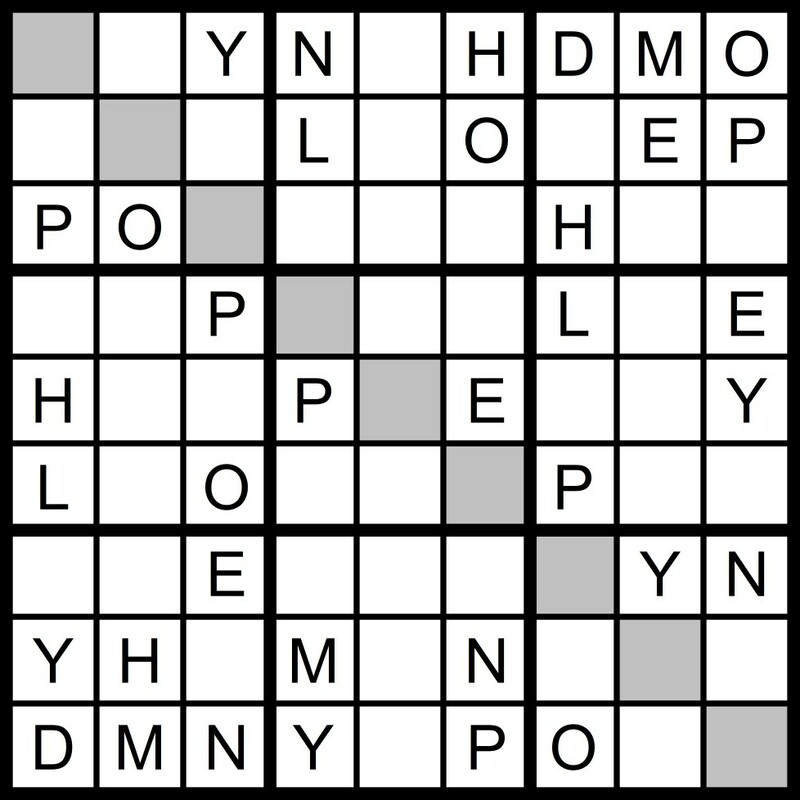 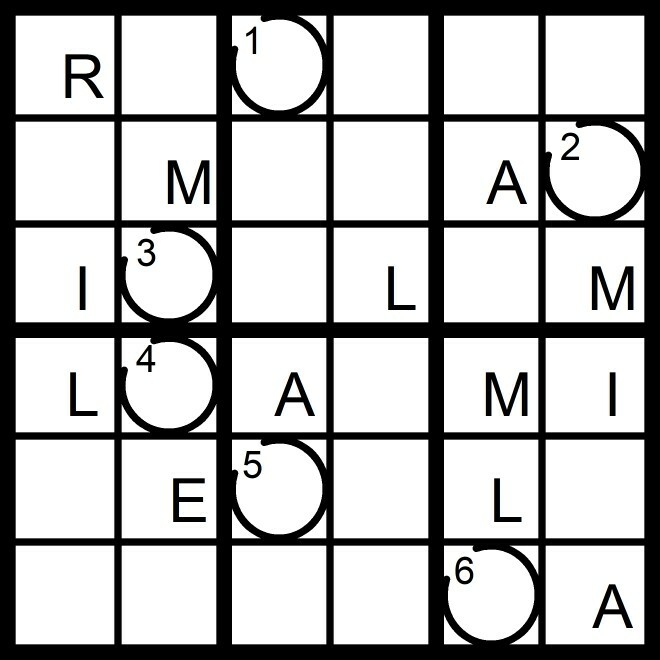 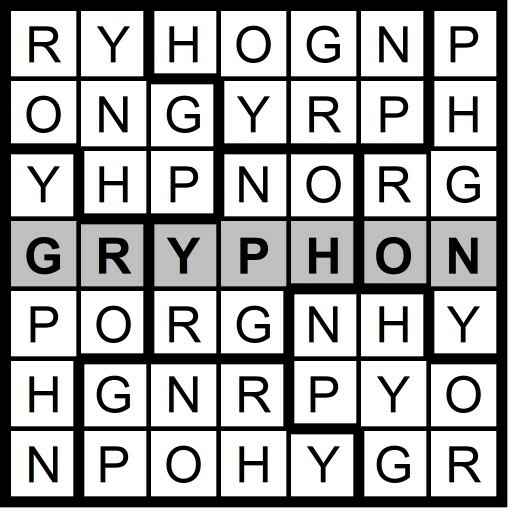 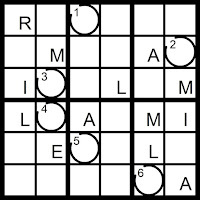 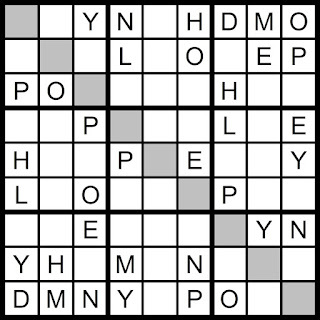 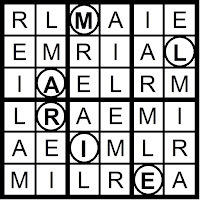 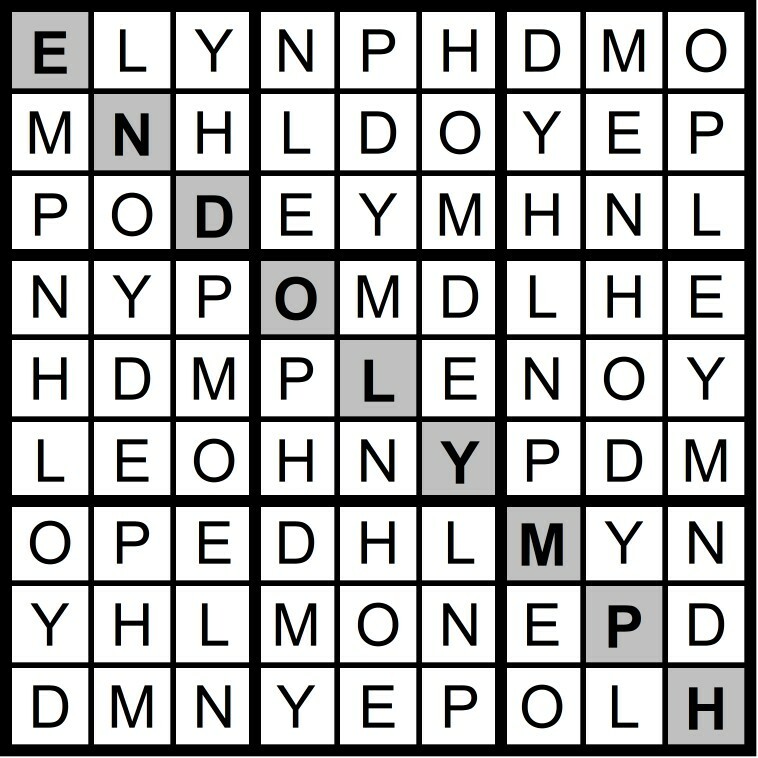 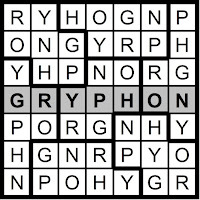 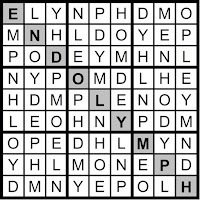 Yesterday's 9x9 Hidden Word Sudoku puzzle was based on the letters PHONY MELD (ENDOLYMPH). 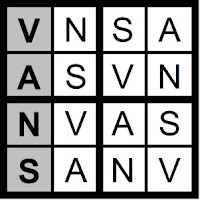 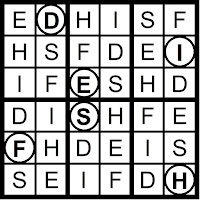 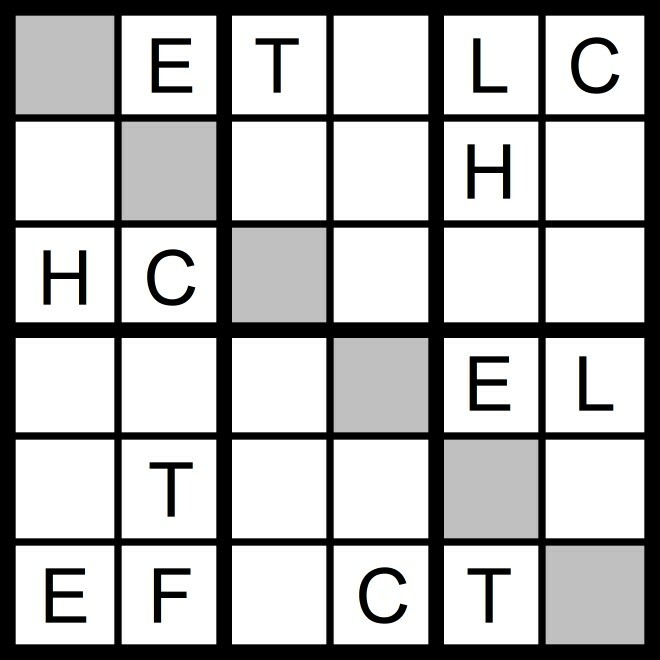 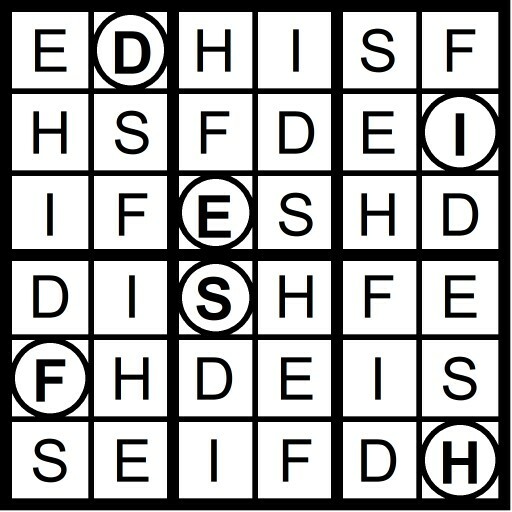 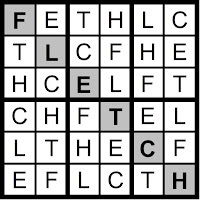 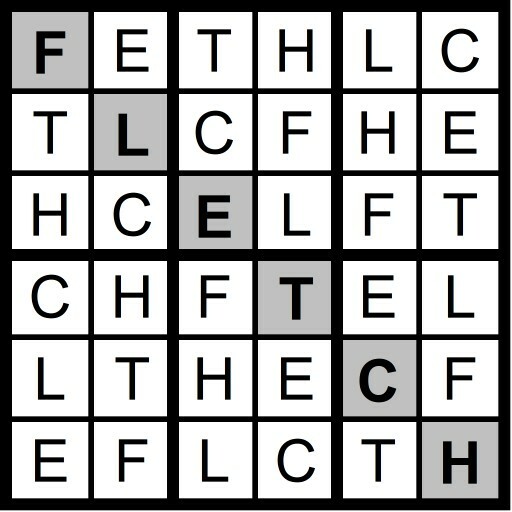 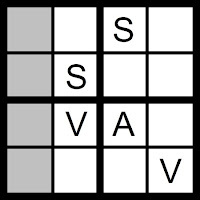 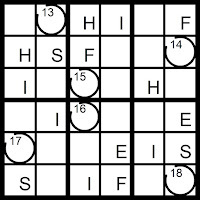 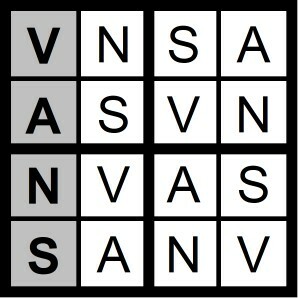 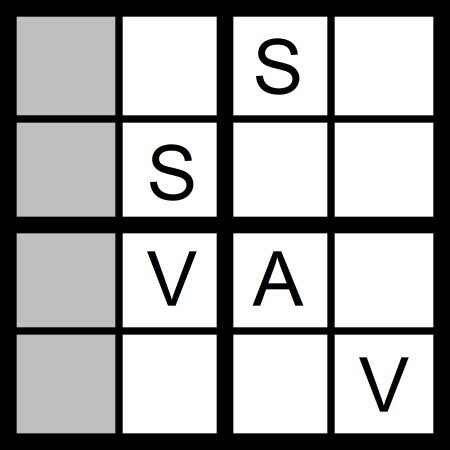 Yesterday's 4x4 Hidden Word Sudoku puzzle was based on the letters AN+SV (VANS) and the 6x6 Hidden Word Sudoku puzzle was based on the letters H+CLEFT (FLETCH). 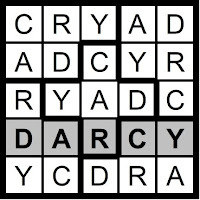 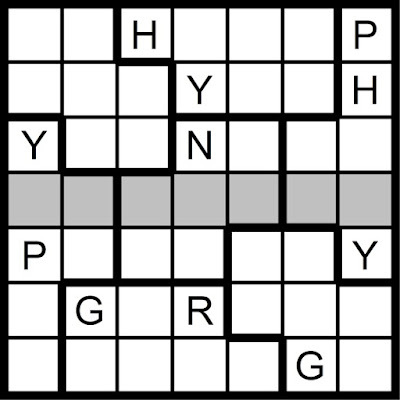 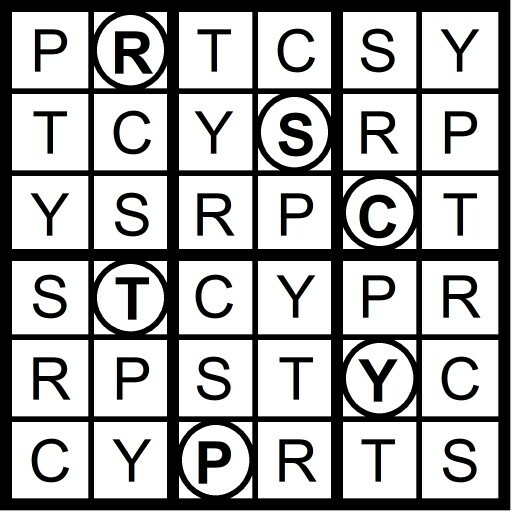 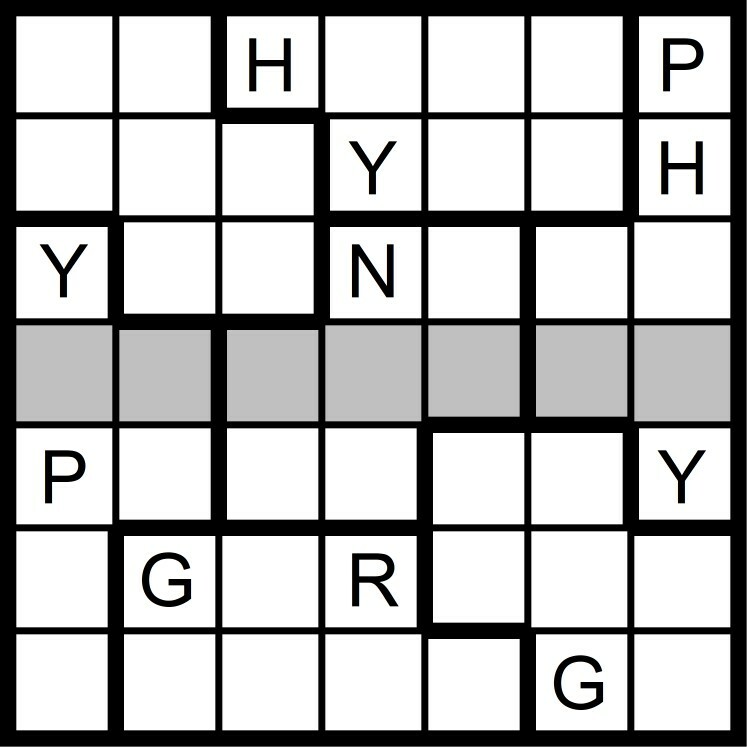 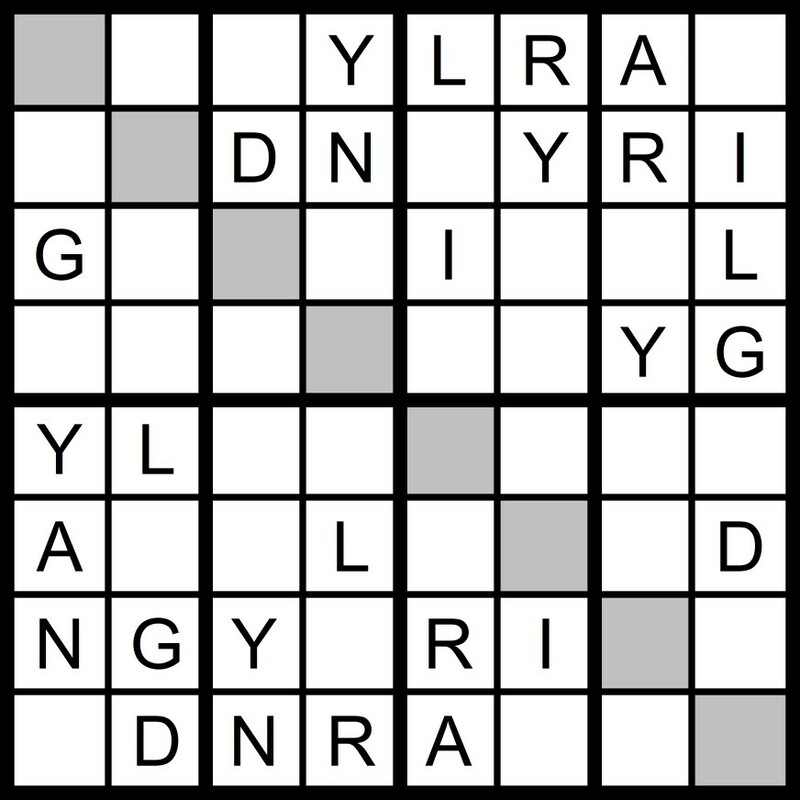 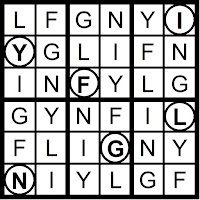 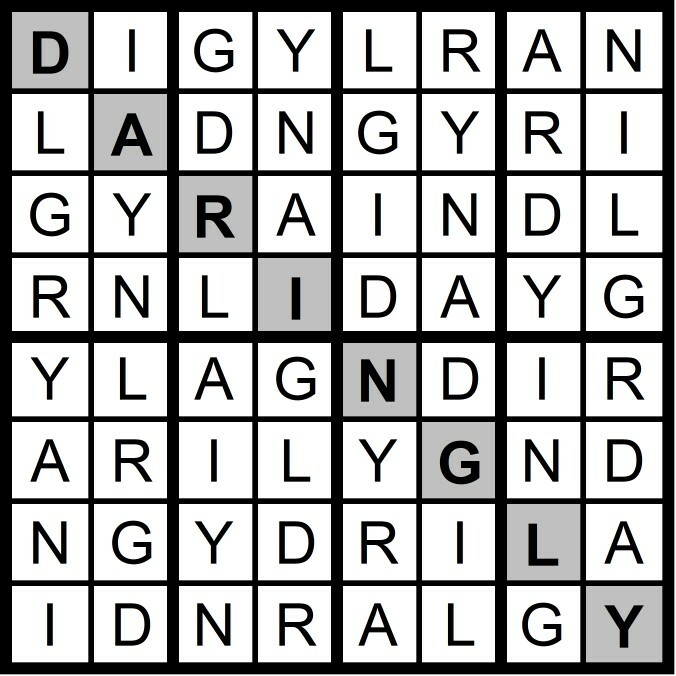 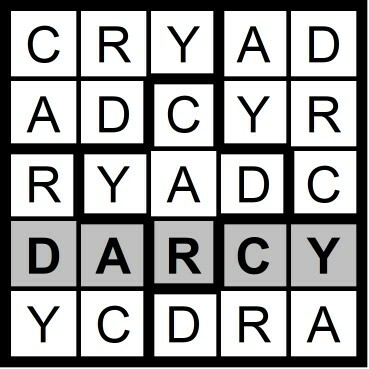 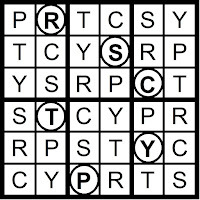 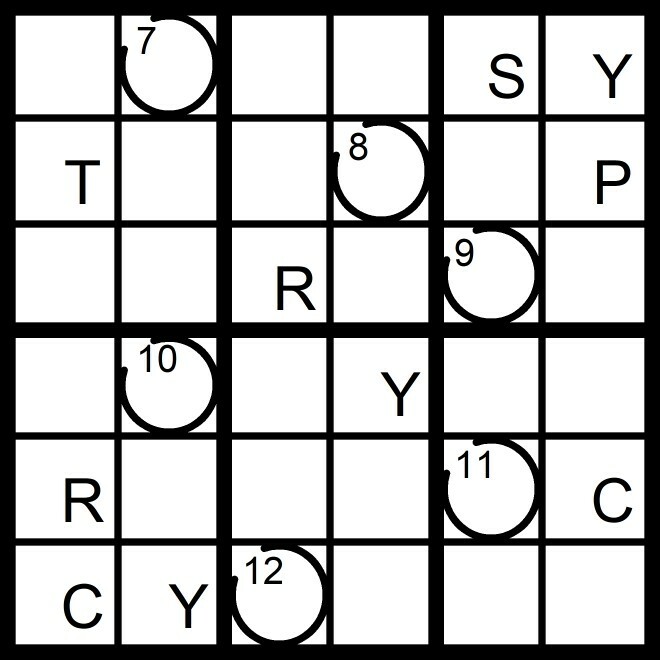 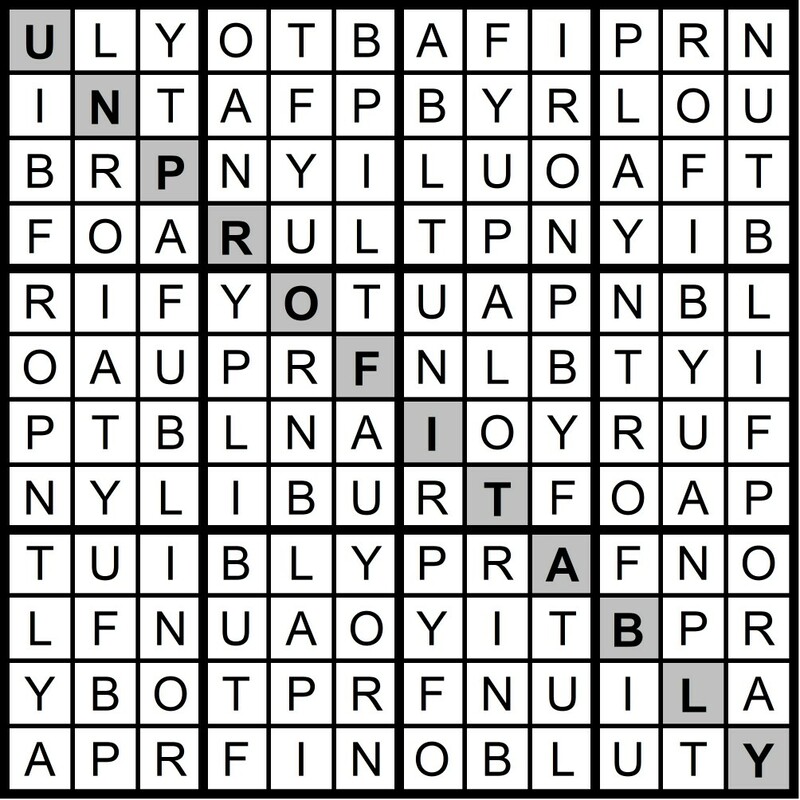 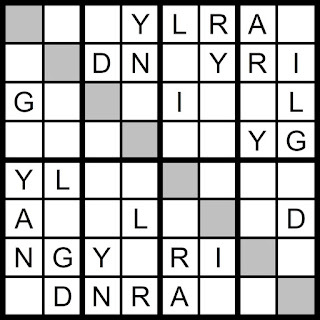 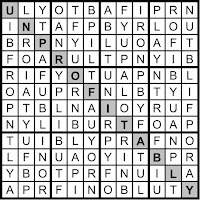 Yesterday's 5x5 Hidden Word Sudoku puzzle was based on the letters DRY+AC (DARCY) and the 7x7 Hidden Word Sudoku puzzle was based on the letters PRONGY+H (GRYPHON). 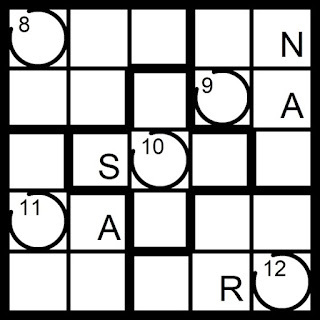 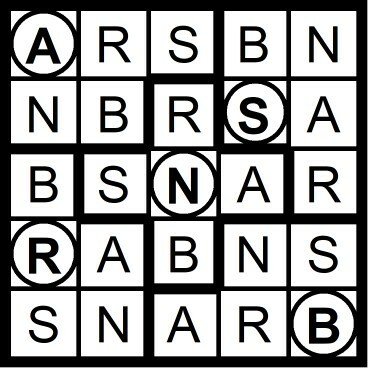 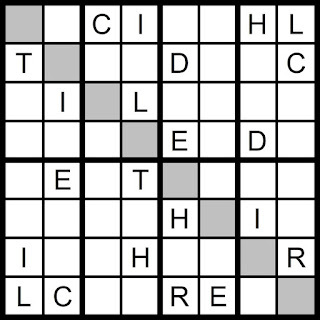 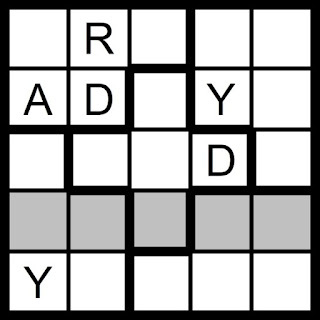 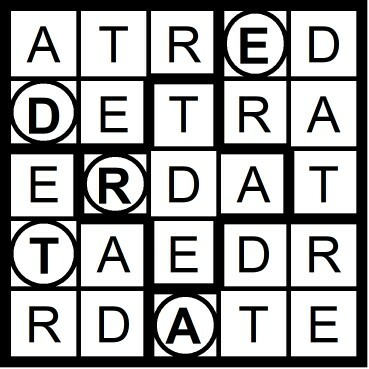 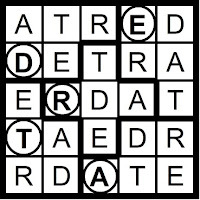 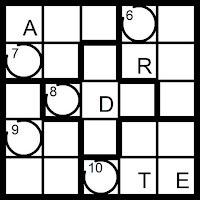 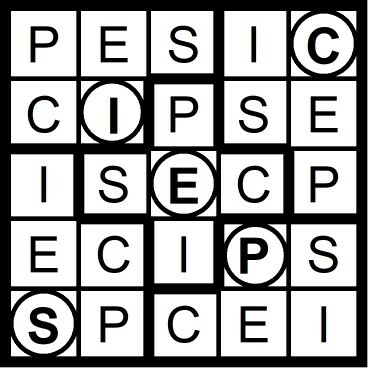 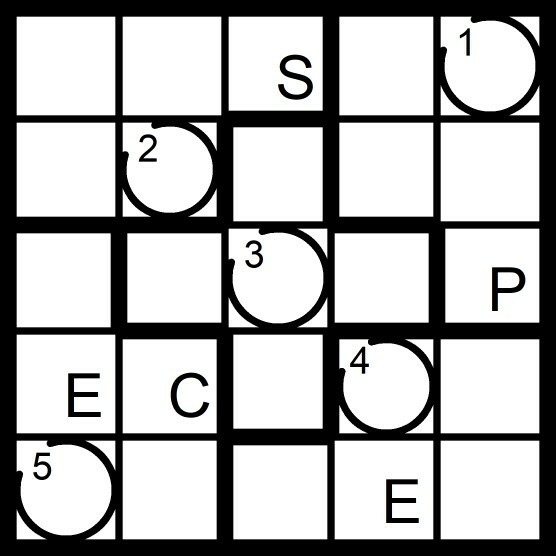 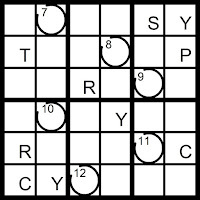 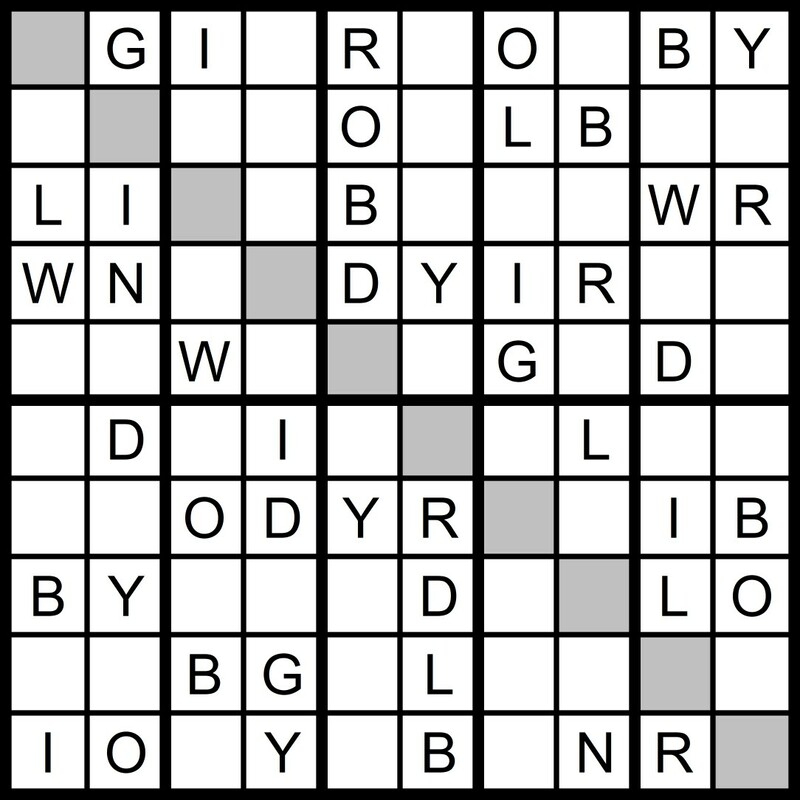 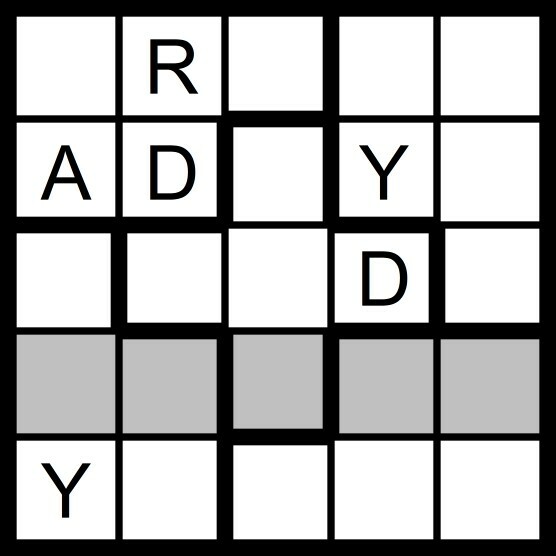 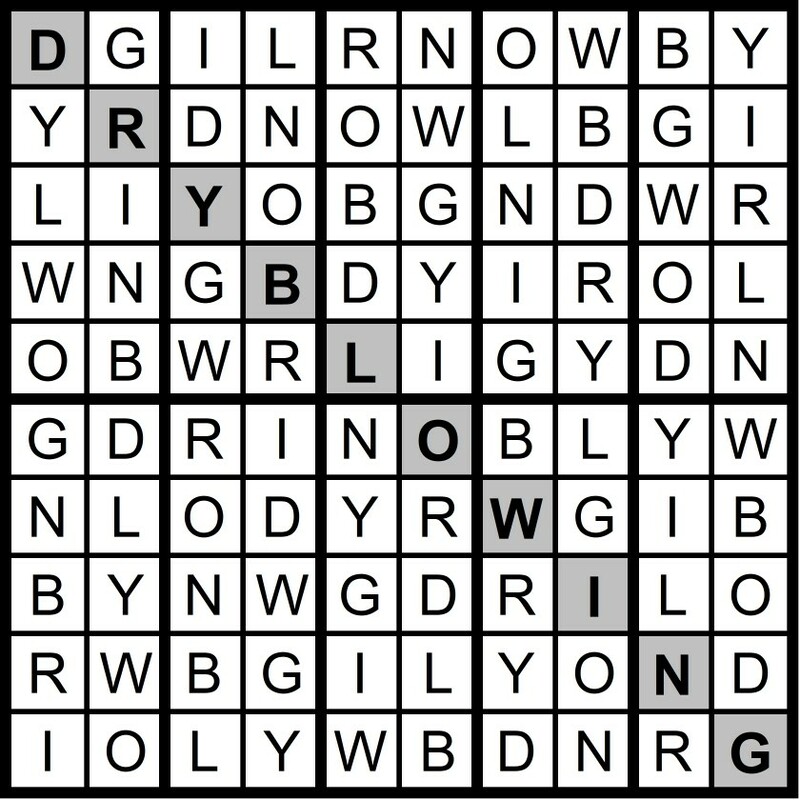 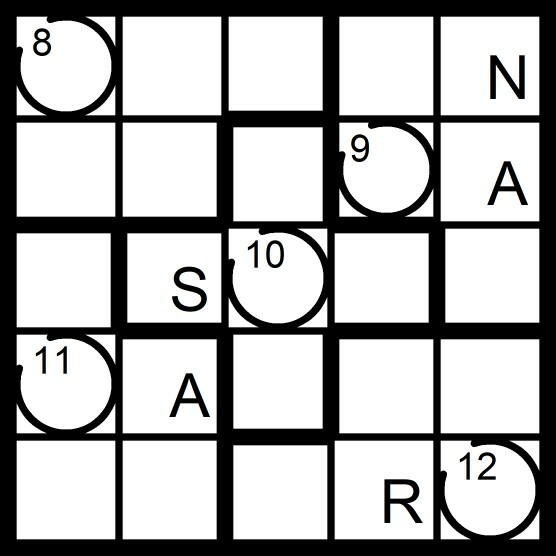 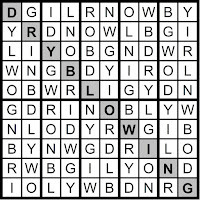 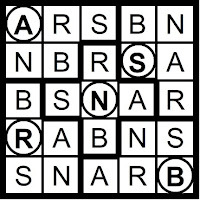 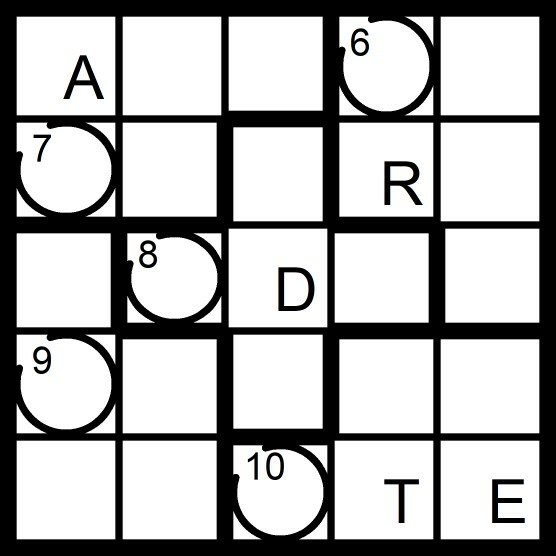 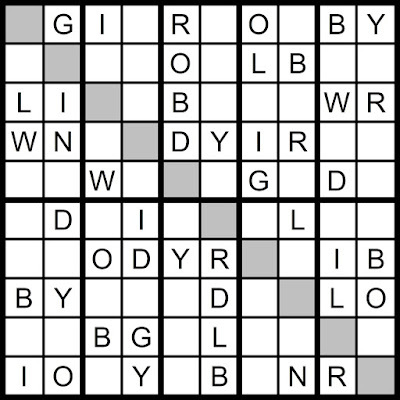 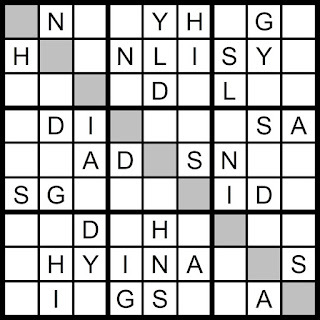 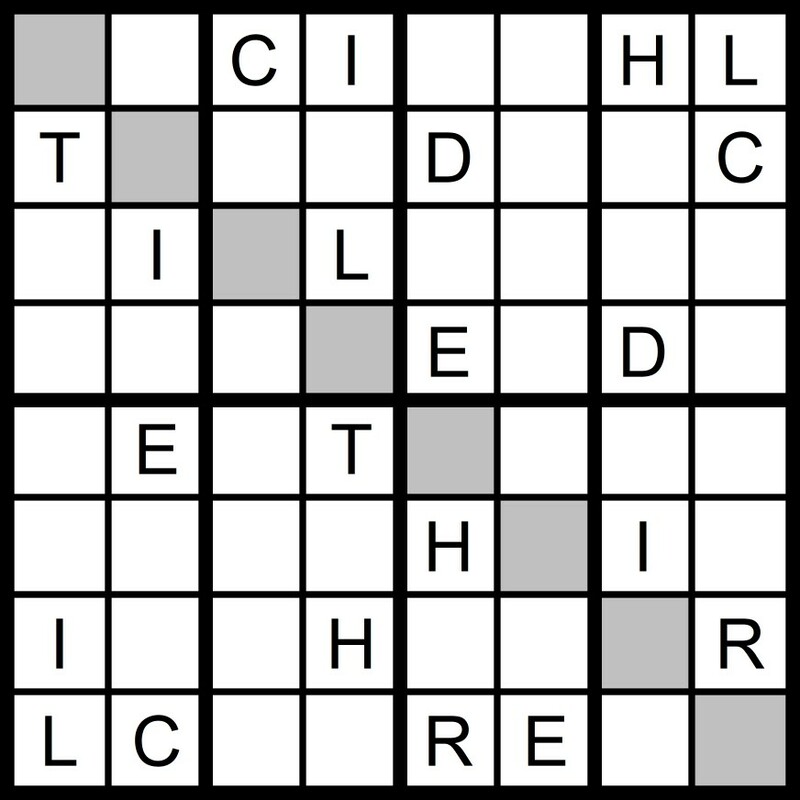 Yesterday's 10x10 Hidden Word Sudoku puzzle was based on the letters BID WRONGLY (DRY BLOWING). 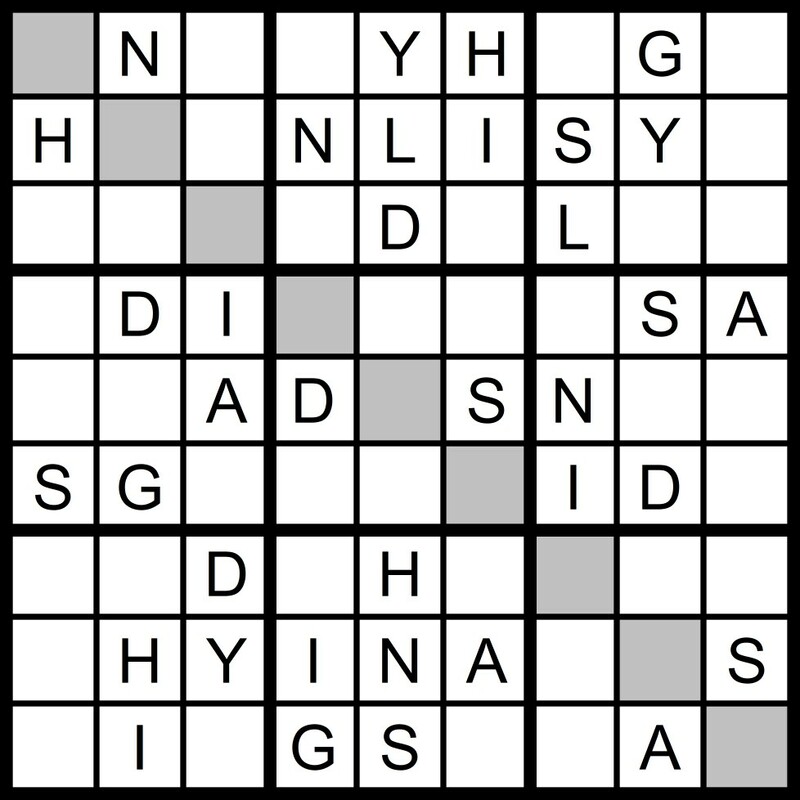 Yesterday's 8x8 Hidden Word Sudoku puzzle was based on the letters I GRANDLY (DARINGLY). 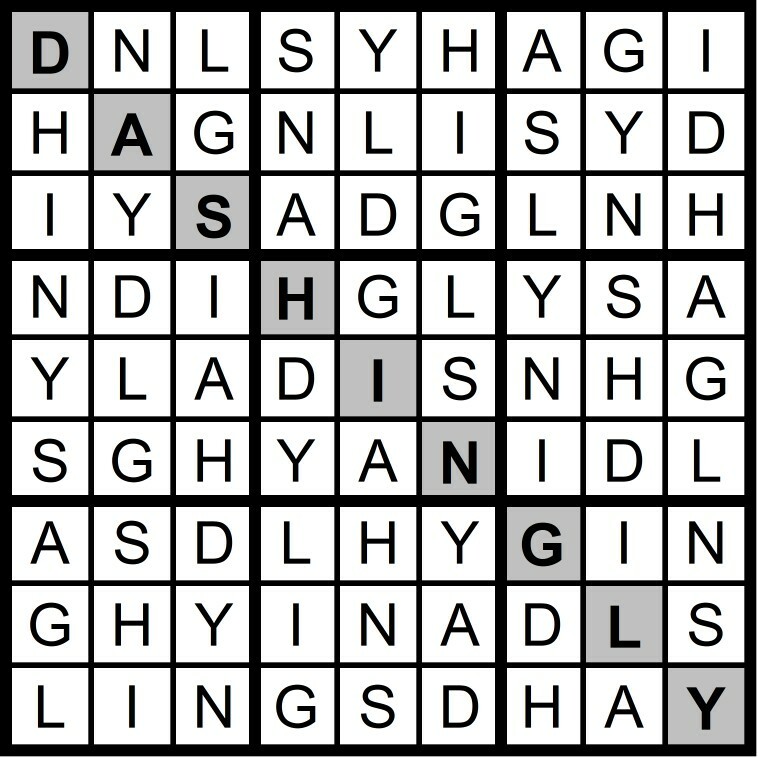 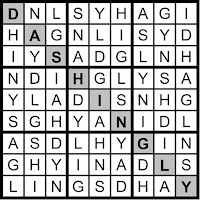 Yesterday's 9x9 Hidden Word Sudoku puzzle was based on the letters IDLY GNASH (DASHINGLY). 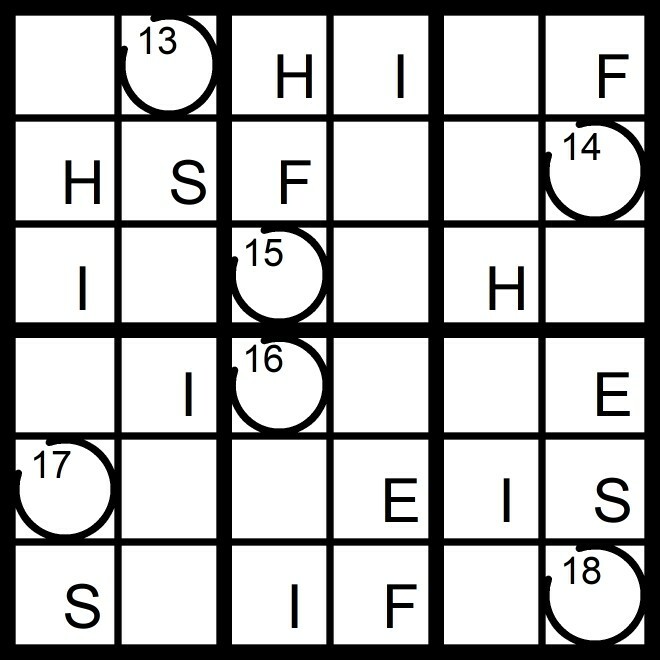 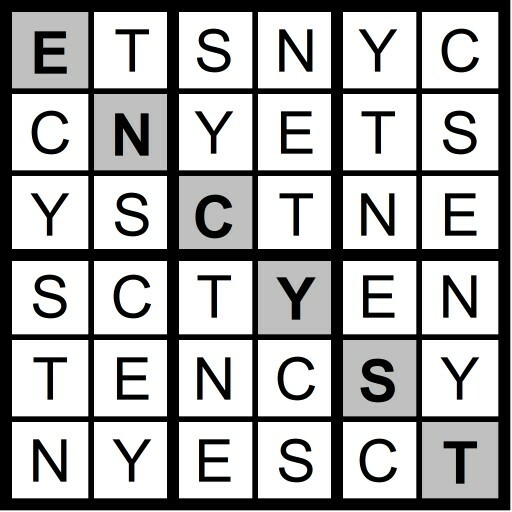 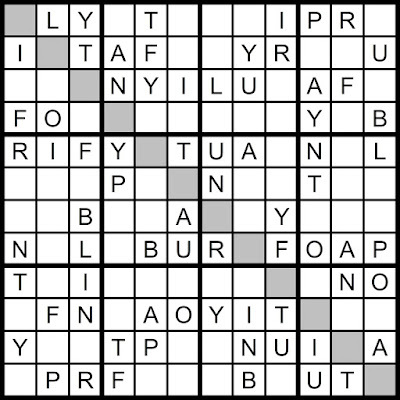 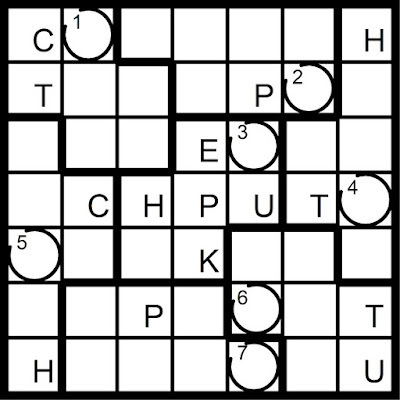 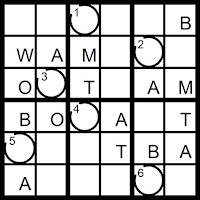 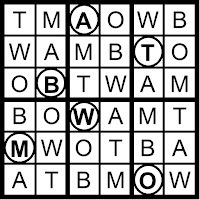 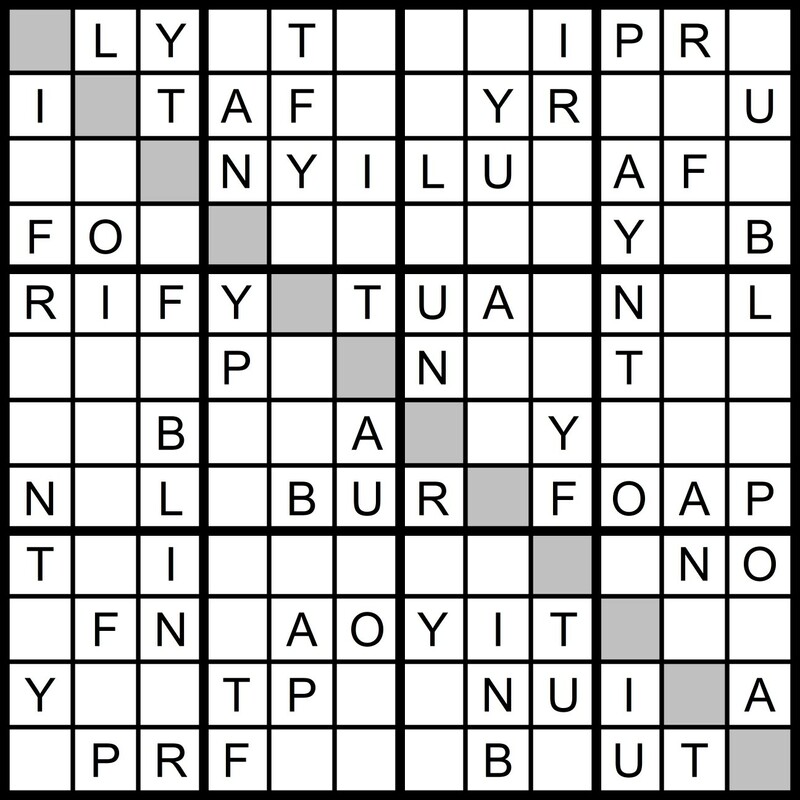 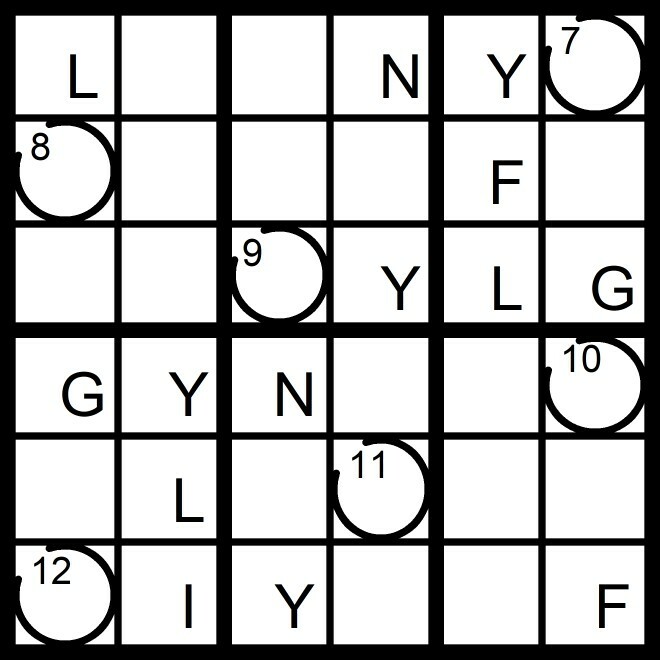 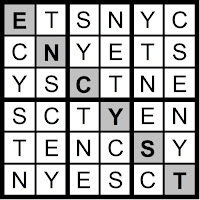 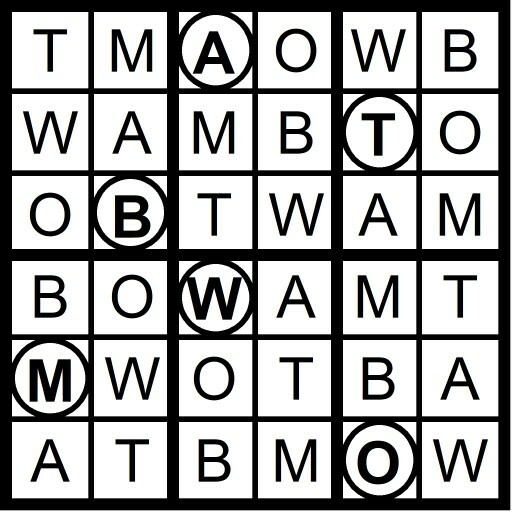 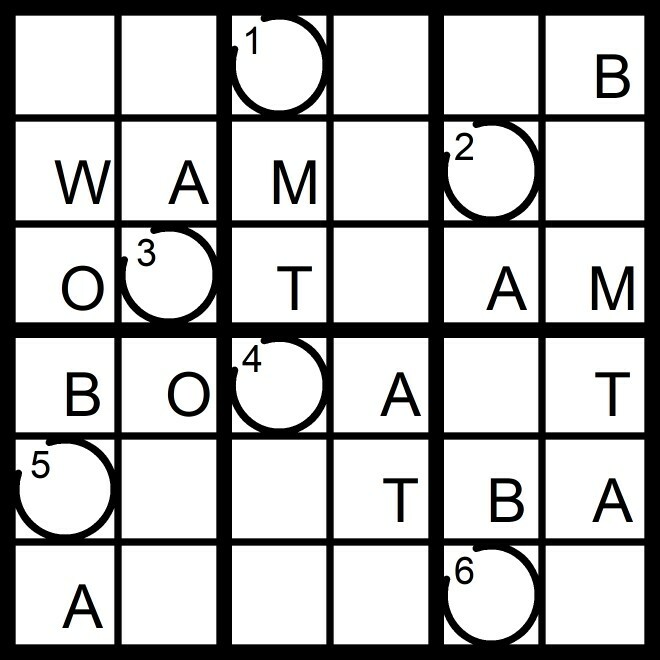 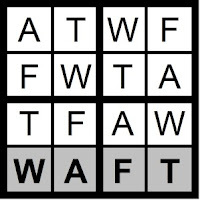 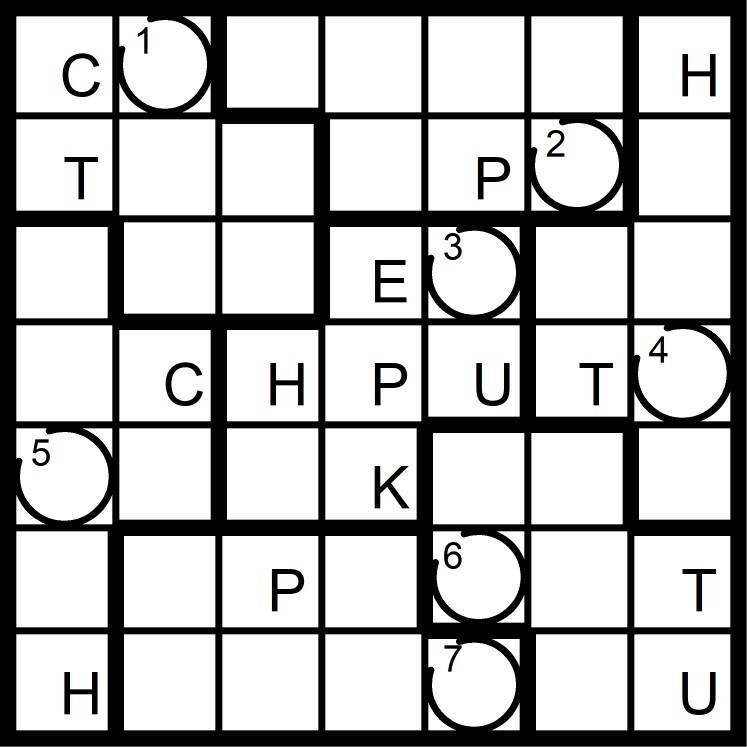 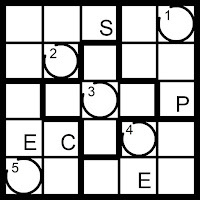 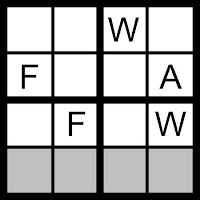 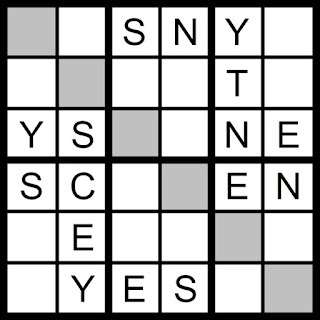 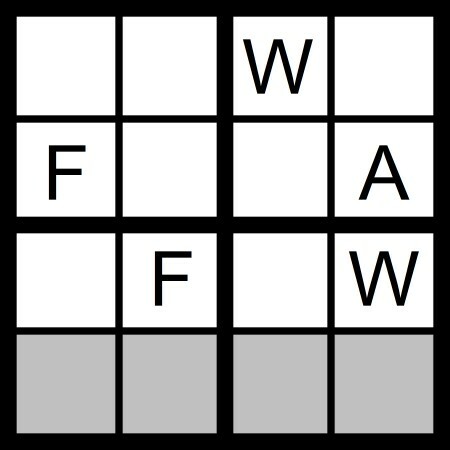 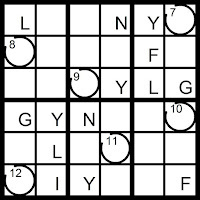 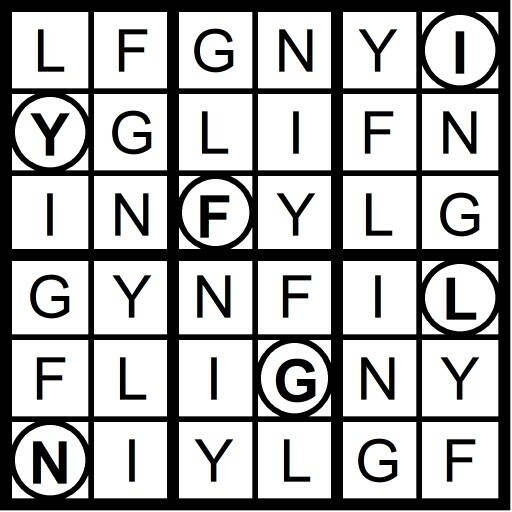 Yesterday's 4x4 Hidden Word Sudoku puzzle was based on the letters FAT+W (WAFT) and the 6x6 Hidden Word Sudoku puzzle was based on the letters Y+SCENT (ENCYST). 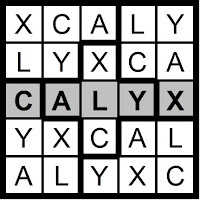 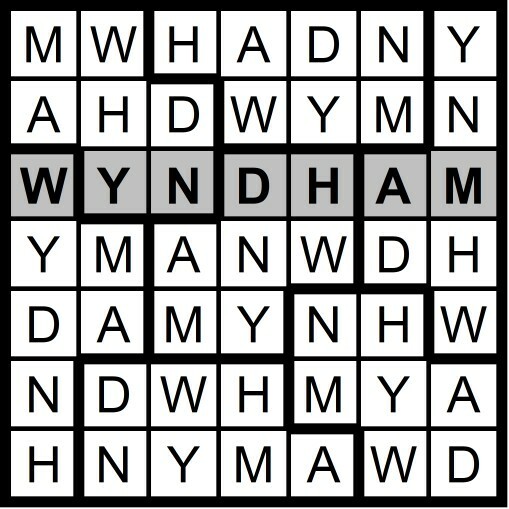 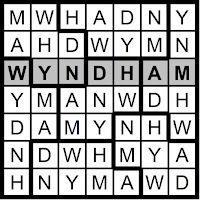 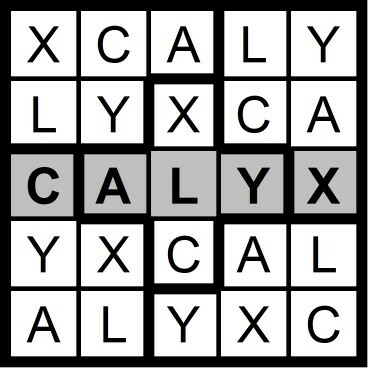 Yesterday's 5x5 Hidden Word Sudoku puzzle was based on the letters XY+LAC (CALYX) and the 7x7 Hidden Word Sudoku puzzle was based on the letters DAW HYMN (WYNDHAM).